When you purchase personalized cutting boards from cuttingboard.ca, you can be assured of quality craftsmanship and fast delivery. 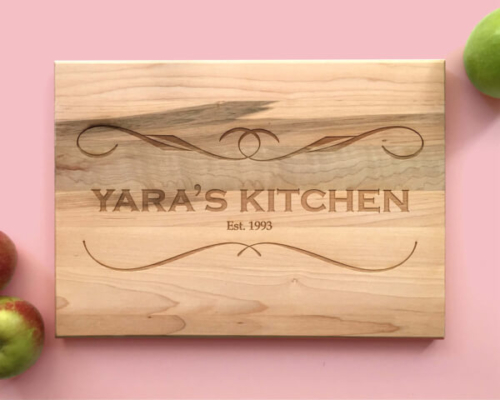 We take pride in creating quality custom wood cutting boards that you will be proud to display your home, restaurant, bar, hotel, or other hospitality venue, or offer as a custom engraved gift. 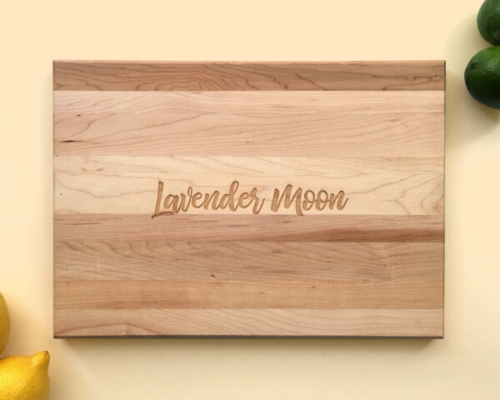 A personalized cutting board is a unique gift that is both beautiful and useful. Made from rich 100% Canadian Maple, you’ll be able to cut bread, meat, cheese, vegetables or anything else you’d like. They’re also easy on your knives and can be hand cleaned in soap and water after most meals. The high quality, low maintenance and customized designs make these wood cutting boards the simple choice when deciding on a gift. Stand out from the rest of the typical gifts, and give a personalized gift that is both practical and meaningful. Whatever the story is, we can make it into a custom cutting board that is as unique as the person receiving it. While they’re useful and functional, they also look great! 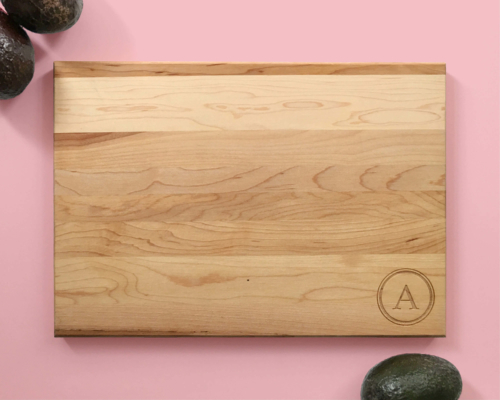 With a rich colour and real wood grain, your custom cutting board will be a tasteful and stylish addition to your home or hospitality establishment. You can choose from any one of our custom designs above. We have designs that are ideal for the happy home, restaurants, or anywhere else in the hospitality industry. Personalized gifts are appropriate for any and all occasions. 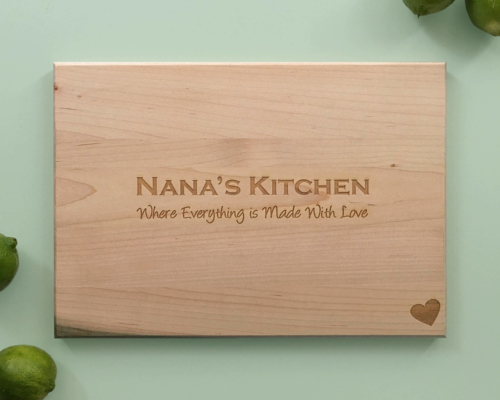 Our goal is to turn your special moments into a personalized cutting board that will outlast your favourite memories. We are passionate about hearing customer stories and how we can help turn their stories into tangible wood pieces of art. 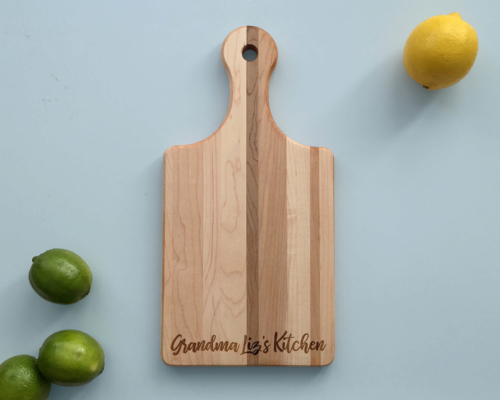 The kitchen is the heart of the home, and a personalized cutting board is a unique gift that can be used over, and over again. Each time one of our quality wood cutting boards is used, it brings a smile to the cook’s face because of the meaning the custom cutting board holds. A custom cutting board is a unique gift for any occasion. Whether it’s a wedding, bridal shower, anniversary or thank you gift, we can guarantee an outstanding and everlasting cutting board. Whatever the occasion is, we’re excited to help you celebrate it! We have many cutting board design options to choose from and expand our selection frequently to meet the growing demand. 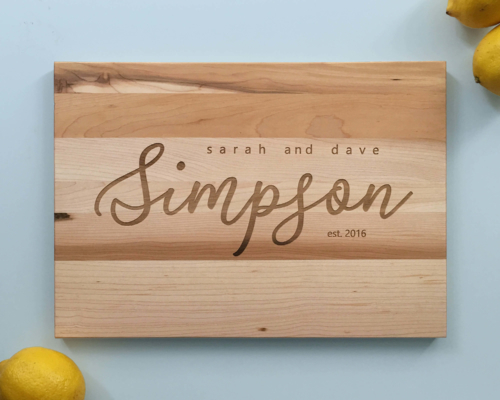 You can customize names, initials and logos with one of our designs to make something that’s just right for you, your establishment or as an engraved gift! Each order is custom laser engraved at our studio using our Universal Laser system. 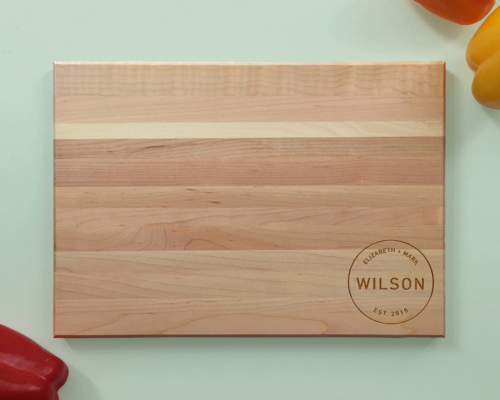 This innovative tool is central to the quality of our personalized cutting boards. With its fine-tuned laser beam, the engraver is able to vaporize the wood to an exact depth, which allows us to create a flat surface with a high quality finish. Because this is a non-contact process, the laser does not affect the integrity of the wood surface. Buying a wedding gift can be a daunting task, especially when you’re short on time, or can’t think of a unique gift idea that will ‘wow’ the bride and groom. Stand out from the rest of the crowd by giving them a unique gift on their special day. 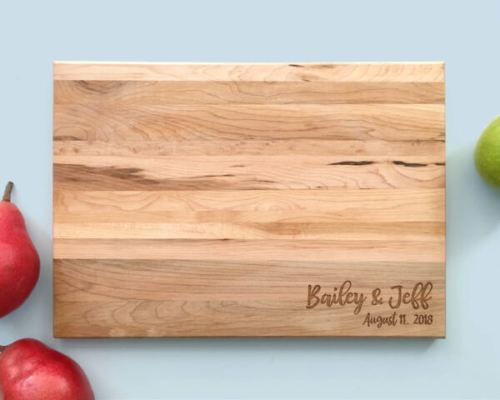 Whether you’re a family member, friend, or in the wedding party, help them remember their day forever with a personalized cutting board. 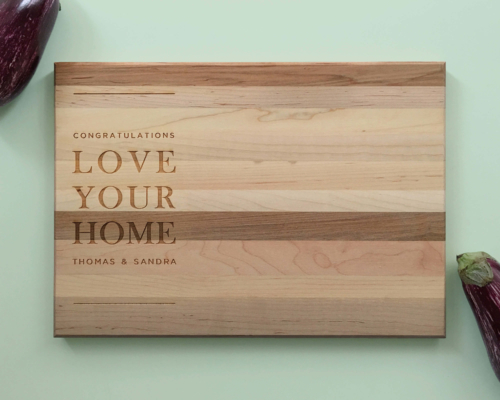 Wood cutting boards last a life time, and with personalized cutting boards you can give a gift that reflects the unique bond between the couple, that will last a life time too. A personalized gift should be as special as the couple receiving it. Show them how much being a part of their special day means to you. 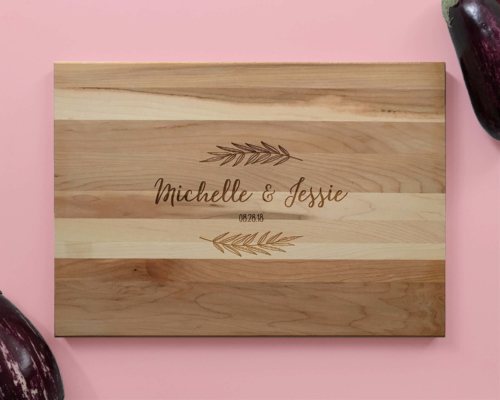 A monogrammed cutting board with the couple’s initials and the wedding date is a unique gift the couple will use for years to come. 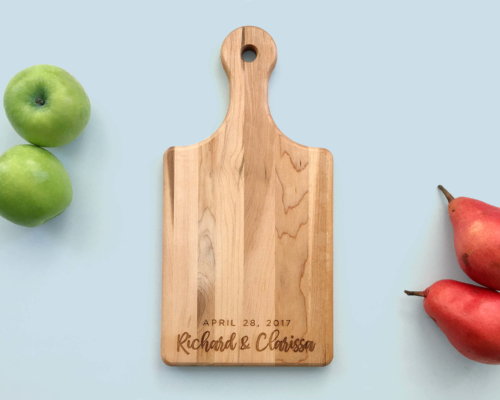 From cooking for one another in the earlier years of their marriage, to creating feasts for children and grandchildren, a personalized cutting board is a reminder of their special day, and the special person who represented their love with such a unique gift. 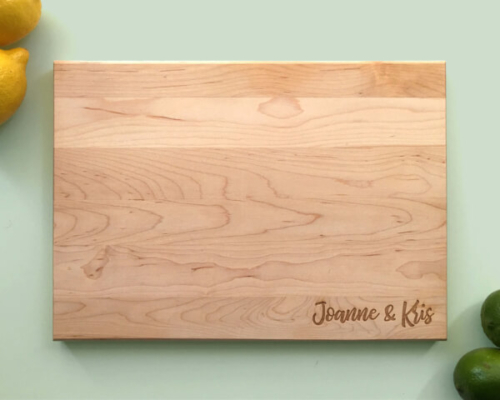 An anniversary is another love story that can be celebrated with personalized cutting boards. Engrave the number of years the couple is celebrating, or their wedding day as a daily reminder, or the long lasting happiness they have shared. 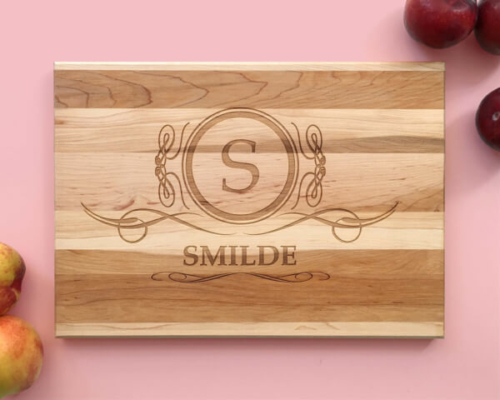 Something so simple will bring a smile to their faces each and every time they use their personalized cutting board. A personalized gift shows the happy couple that you went the extra mile to give them something that demonstrates how well you truly know them. Something as simple as a custom cutting board is not only practical, but unique with its personalized touch. You can be assured that they will love bringing out their engraved cutting board when entertaining guests in this new chapter of their life. 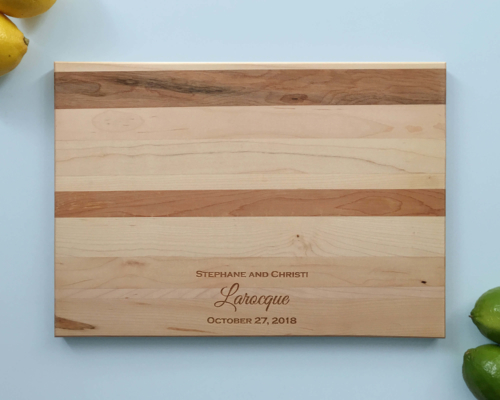 Celebrate a unique love story with personalized cutting boards; a unique gift for a unique couple. If you’re stuck on a gift basket idea, why not add personalized cutting boards to complete your idea. Something as simple as wine and cheese, with a personalized cutting board could go a long way. It’s easy to put together, and the recipient is guaranteed to get lots of use out of it. Many people struggle with where to start when it comes to a gift. Don’t spend endless days trying to find a quality gift basket with the right ingredients when you could put one together yourself, starting with a custom cutting board. It’s a unique and thoughtful gift for any occasion. 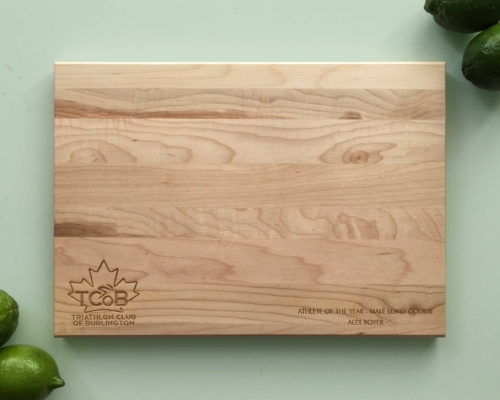 Our personalized cutting boards have impeccable craftsmanship and the quality of 100% Canadian Maple wood will last you for years of dinner preparations. Custom cutting boards are our passion, and we want to share what we love with those you care about most. Our goal is to inspire passion and the spirit of giving, with a unique touch. Leave a lasting impression by giving a personalized gift basket, filled with all their favourite goodies, and a personalized cutting board. 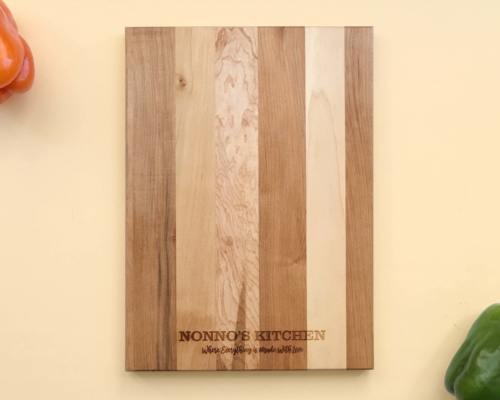 Whether you’re taking the next step into a new home, or know someone making that transition in their life, a custom cutting board is a great house warming gift. Help them get started in their new forever home by giving a gift that is both practical and meaningful. A wood cutting board is a staple piece in any kitchen. Why not have one that is unique to them and their new home? House warming gifts are great, but only when it’s something the home owner can really use. Custom wood cutting boards will not only be useful when cooking for guests, but a symbol of this exciting moment in their life. Step outside the box, and away from bottles of wine or candles, and give your friends and family a gift that is not only practical, but meaningful and fun! When searching for the right gift to give a client, colleague, employee, or a superior, it’s important that the gift represents the distinctive relationship, and accomplishments of the recipient. Whether they received a promotion, or you want to say a small thank you, finding the appropriate gift can be difficult. Custom cutting boards are unique gifts that don’t overstep the boundaries of business etiquette. It’s simple enough that it can’t be misconstrued as inappropriate, but still conveys the message of appreciation. 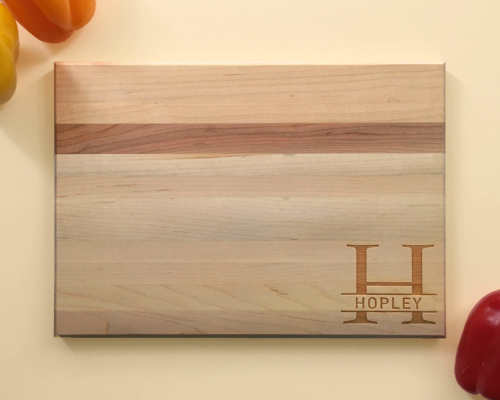 For a colleague or employer, a monogrammed cutting board with their initials is an understated symbol of admiration. Congratulate a colleague for a job well done, or give this unique gift to an employer for the holidays. 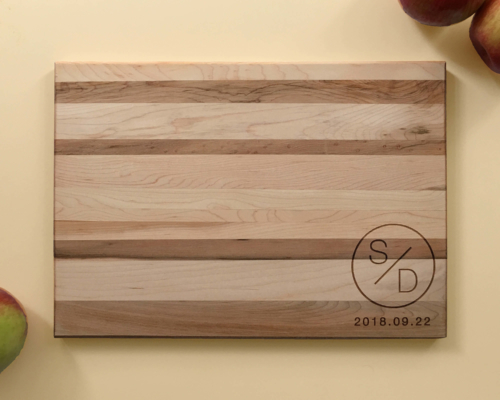 If you want to show your appreciation to multiple employees, engraved cutting boards with the company logo is a practical and unique gift that will convey your gratitude. Something so simple goes a long way with employees; they will be grateful for the customized cutting boards. Whether you’re a small or medium business, or a more established company or corporation, branding is extremely important in the growth of a company. Turn your brand into a visual representation of your company for your clients and potential clients. 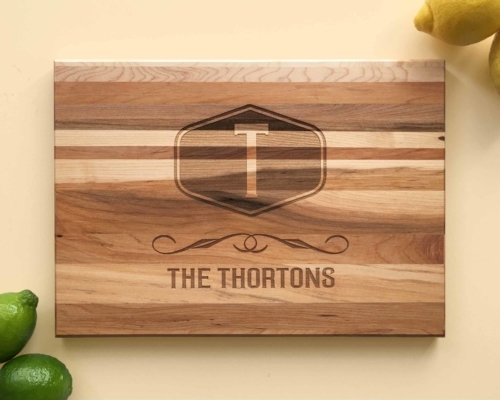 We can turn your thoughts into a reality by using your logo to create a custom cutting board. Pens and mugs are a great personalized gift to give potential customers, but they are overdone, and are easily lost in the sea of other trinkets given by competitors. Personalized cutting boards are unique gifts that will help you stand out from the rest. 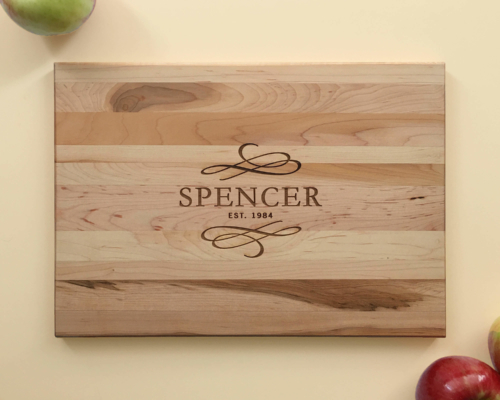 Personalized cutting boards with your company logo will also help you appear more established to future clients. They’ll see the stability in your brand and take note of the extra mile you went to get your company’s engraved on a solid piece of Canadian Maple. 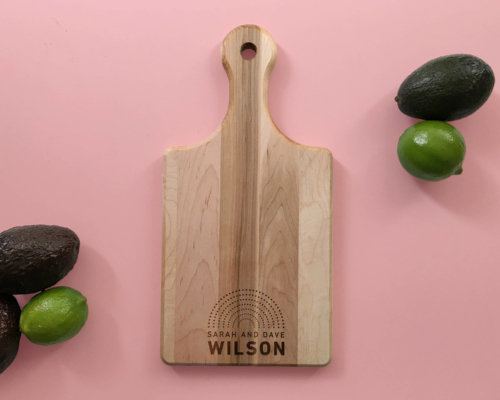 Your clients aren’t likely to forget the company that gave them a personalized cutting board, especially when they see the quality craftsmanship, and put it to use each time they prepare a meal for their family.